TBTI has recently launched its Information System on Small-scale Fisheries (ISSF), the first interactive global repository of small-scale fisheries, providing information on key characteristics of this sector in various locations around the world, as well as synthesized knowledge about their importance, contributions and potentials. Through crowdsourcing tools, it invites people with information on different facets of small-scale fisheries to contribute data to help enhance overall understanding and global recognition of small-scale fisheries data. The ISSF will capture the key characteristics of small-scale fisheries in any given location across the ‘fish chain’ from aquatic ecosystem to plate, including the nature and type of fisheries and fishing activities, fishers’ relationships with fish buyers and money lenders, and the legal pluralism in the rules and norms governing fisheries. This system uses innovative ways to visualize information to help generate new knowledge and for effective communication with end- users, such as universities and policy makers, and provides a solid foundation for multi- level analysis of small-scale fisheries that will enable appropriate policy development and decision-making. 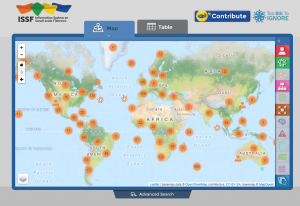 Be part of the ISSF community and contribute!